Is SAI mostly for gifted and talented students? Or is SAI for students having trouble with math? SAI sounds like a good idea – but does it really work? What is the SAI Advanced class about? Are there SAI courses during the school year? Why should my child study algebra while still in the elementary grades? My child’s math program at school has a special way of teaching math. How will SAI affect that? How does the math of SAI relate to the math of the so-called “integrated math” courses? Will SAI be too ‘hard’ for my child? Too *easy* for my child? How effective or long-lasting can a week-long, half-day program be? Why not just wait until my 3rd grader or 5th grader is older before studying algebra? Or why not just wait until my child can take algebra as an advanced class in 6th or 7th grade? My child is only going into 2nd grade but is working out of a higher math book that is 2 or 3 years ahead of grade level. Can my child enroll in an older grade level of SAI? SAI is like a rising tide that lifts all boats. Whether students are talented in math or struggling with math, our experience is that students who complete SAI acquire a deeper, better understanding of whatever level of math they are studying. SAI enrichment helps kids see connections that reveal the unity of mathematics across topics and across grade levels. Students with a wide range of mathematical and academic abilities have been successful in SAI. In SAI, we use algebra to illustrate the structure of math – the things that are true in ALL areas of mathematics – variables, fractions, place value, operations, negative numbers, etc. This deepened conceptual experience of important math concepts helps students across a broad range of abilities better understand elementary arithmetic, while also better preparing them for the algebra that lies ahead. Since we began SAI in 1995, almost 4,000 students – mostly in grades 3-6 – have successfully completed SAI. Lots of SAI students had older siblings in our program, and many parents simply rave about how helpful SAI was for their child (or children). Year after year, parents keep signing up their kids, and students from all over the St.Paul-Minneapolis metro area – and from as far away as Alaska, New Hampshire, Ohio. Texas, and Indiana – have attended SAI. SAI Advanced is for students who have already attended an SAI 567 course. In the SAI Advanced class, we go further, faster, and deeper into what students love about basic SAI 567. SAI Advanced continues to better prepare students for actual use of higher algebra concepts, flexibility in thinking, and creativity in problem solving, with a bit more use of abstract concepts and abstract procedures. The course includes several types of math competition – including one that a curriculum reviewer has called “the Porsche” of math competitions. In the past several years, we have had the opportunity to make special arrangements with several different Twin Cities homeschool groups to offer SAI sessions for them, at various times during the academic year. • 3rd & 4th grade co-ed: minimum 8, maximum 12. • 5th & 6th grade co-ed: minimum: 12, maximum 16. Tuition depends on several factors (including distance, rent, enrollment, and location) and is on the order of $150-$170 per student. Contact us by phone or email if you are interested in such an opportunity. 1. SAI provides a lasting, hands-on, enjoyable first exposure to algebra that shows kids that algebra makes sense. 2. SAI gives students a solid “sneak preview” of the algebra that awaits them down the mathematical road. 3. The many isolated and separate procedures and skills of elementary arithmetic too often simply hide the surprising amount of connectedness that exists in mathematics. SAI’s methodology reveals the connectedness of algebra and arithmetic. A • B = B • A, or C + D = D + C.
In other words, algebra is “the big picture” of arithmetic. Kids need to see that! With SAI’s emphasis on using algebra to illustrate principles that are true in all areas of mathematics, students learn broad and practical principles that are helpful for ANY mathematics curriculum or ANY methodology. 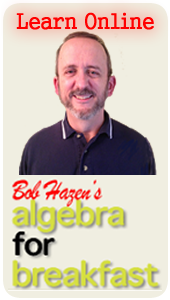 In addition, the algebra content in SAI covers substantive and challenging algebra material that is rarely, if ever, covered in normal elementary math curricula. SAI works well either with a traditional approach to math or with the newer “problem-solving” approaches to math. SAI helps students think more “abstractly” and in “general ways” about mathematics – which is supportive of both traditional and integrated math. Of the 4,000 students who have attended SAI since 1995, there have been only 2 or 3 students for whom SAI was too hard or too easy. This is 1 child in about 2,000. Please contact us if you have specific questions about your child’s abilities or needs. Not very effective at all – IF we merely focused exclusively on paper-and-pencil symbol work (as most traditional algebra courses do). But in SAI, we use color, shape, size, texture, music, movement, hands-on activities, symbols, AND careful wording in a multi-sensorial way to embed algebra concepts deeply into the minds and memories of kids. We also us algebra to illustrate important principles – “grand ideas” – that reveal the unity and connectedness of all mathematics across grades and topics. What we teach in relation to algebra also applies to other topics like place value, basic arithmetic facts, and fractions. As one mother wrote to us, “My daughter loved the algebra and she also has shown so much improvement in fractions and place value as well.” A 3rd grade student who learns these principles will be able to use them repeatedly throughout elementary school, middle school, and even high school. Students also learn algebra in ways that “turn them on to math” by seeing some of the interesting and cool aspects of mathematics. The short answer: If you wanted your child to learn a second language, it’s always better to start at a younger age. The same is true with algebra – it’s often too late if you wait! Far too many kids have even more time to be exposed to bad explanations, bad teaching, and bad experiences with math. SAI turns kids on to math at a younger age! The longer answer: there are several strong and affirmative reasons for your child to attend SAI at an age earlier than is the customary age of first exposure to substantive algebra. Basically, the earlier the better! 1. SAI focuses on the structures of math – on how math works. Even for advanced students who take algebra at an early age (like in 6th or 7th grade), most algebra books don’t deliberately and overtly focus on the structures of mathematics and how algebra connects with arithmetic. But that is precisely our focus in SAI, which is helpful to kids with a wide range of academic abilities, including advanced kids. 2. SAI goes beyond procedures. For virtually all elementary students, there is an excessive focus on the procedures of math – doing addition with “carrying,” or doing subtraction with “borrowing,” or doing long division, or doing fraction operations. Even for gifted kids taking algebra at an early age, the focus is still usually on the procedures of algebra – doing algebra addition, or doing algebra multiplication with FOIL, etc. In SAI, we have the time to focus on the ideas that make arithmetic and algebra work. SAI’s focus is on the structure of mathematics, and we use algebra to do this. This approach helps kids make sense out of both algebra and arithmetic. 3. SAI teaches the big picture. While most elementary math texts focus on the many and various detailed procedures of math, they often don’t provide a “big picture” perspective of what’s going on with math. As we provide in SAI, a careful exposure to algebra provides the big picture perspective for mathematics, since one definition of algebra is simply “generalized arithmetic.” We focus on the structure of mathematics – the principles of mathematics – that endure across topics and across grade levels, which helps kids make better sense out of the arithmetic they’re already studying. My child is only going into 2nd grade but is working at a higher level math that is 2 or 3 years ahead of grade level. Can my child enroll in an older grade level of SAI? The short answer is no. Our experience with this issue is that you should enroll your child in the customary SAI grade levels. A longer answer with discussion as to why follows in the next several paragraphs. There are several considerations to keep in mind with kids who are working above typical grade level. On the one hand, we are in favor of opportunities for children who are exceptionally bright to be able to be placed at a math level that is challenging. On the other hand, there are several distinct factors that need to be considered with such bright children in regard to SAI. 1. With children this young, other dynamics (like attention span, developmental maturity, and emotional maturity) play a significant role in the SAI experience. We have found that waiting one more year to enter the customary SAI level makes a significant difference in their ability to retain, transfer, and apply what they have learned at SAI. 2. Even bright 2nd graders can find difficulty with the vocabulary and reading comprehension needed at even the 3rd-4th grade level of SAI. 3. At the elementary mathematics level, a significant number of children who are doing well at math do not always have a solid grasp of the conceptual foundations of what they are doing. Think for a moment: how many adults have you heard say, “I was good at math up till about 5th grade, and then it started not making sense any more”? This happens for lack of a solid grip on the concepts of the math being studied. In SAI, we give students a strong conceptual foundation of the math they are studying – they can literally see what’s going on. Because of the mathematically rich environment that we create, SAI is like a rising tide that lifts ALL the boats. So bright 3rd graders in our SAI 3rd-4th grade session have their competence and understanding enriched and deepened – and struggling 3rd graders have their competence and understanding deeply enriched as well. So our advice again is this: Enroll your child in the customary SAI grade levels. They will still see material and topics that they normally won’t see until middle school or junior high. If your child is too young (entering only Grade 2 for the fall after the SAI course), then wait a year and enroll the following summer. The only exception here would be for a child at 2nd-3rd grade age who is already studying a traditional Algebra 1 course, in which case this is no exception at all, for a child already studying algebra at such an early age has no need for SAI.